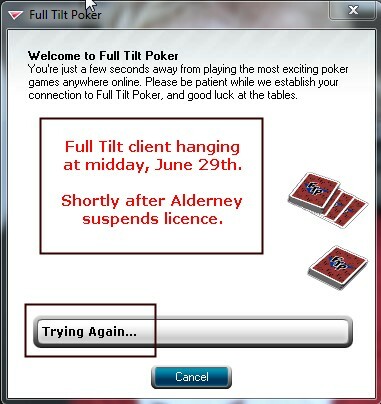 Alderney have finally got ’round to suspending Full Tilt Poker. Click here to see a copy of the full statement from the regulator. It could spell even more trouble for players. More to follow later. Update: Looks like operations have fully ceased / been suspended – reports are that all games have stopped, table play was halted – and when I attempted connection – the client just hung. This is going to make the interubes pretty hot for a few days. Here’s hoping that players get paid. Here’s a screenshot at midday on the 29th. Update: Read the railbirds thoughts at 2+2 and get a taste of what are the Poker community thoughts – here. « Google Correlate: Your own trend data is your friend?